Most sessions can be booked all year around across the seasons. All workshops can be adapted for small groups of children with SEN.
Get up close to a variety of plants, developing knowledge of the function roots, stems, leaves and flowers. Get to know the pollination process, the lifecycle of a plant and what it needs to survive. Hands-on activities include digging up roots and investigating the jobs they do, and a plant ID hunt. We set up practical enquiries to uncover woodland and wetland habitats. Pupils identify, observe, predict and record findings in a mini beast hunt and pond dipping discovery using simple equipment. 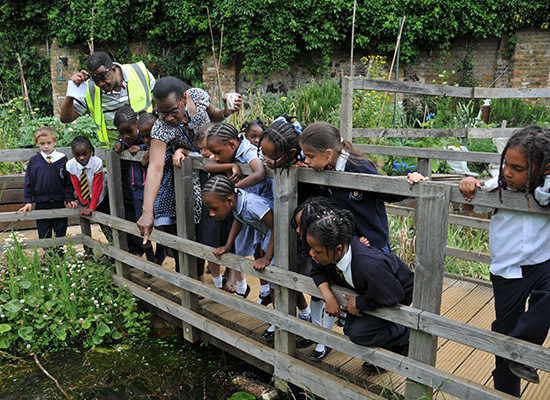 Looking at the park seasonally, we explore what lives in the park whilst developing an understanding of food chains. Children present findings in fun role play activities as Garden Guides. Designed for year 3, we discover what really is below our feet. Pupils perform practical enquires using pipettes and magnifying glasses to work scientifically. They classify and identify rocks and soils as organic matter, and compare their appearance and properties. This session is for year 5 classes. Ancient tales are our starting point for this investigative journey. In small groups, pupils are challenged to predict relative sizes and distances of the sun, moon and Earth. Pupils discover why we have day and night and explore the Earth’s rotation and orbit relative to the sun in physical games. In our dark room, view the phases of the moon through illustrative demonstrations. Live the life of a scientist through research into habitats and animals. Make hypotheses, investigate your predictions, and record and present your own conclusions. This workshop is a must for year 5 and 6. Transform your class into poets. Choose between water, trees, or butterflies as the theme of your session. Read, learn and perform inspiring poetry, build vocabulary and poetic techniques including simile, metaphor, personification and onomatopoeia. Use the natural environment as a stimulus for creative narrative work. Choose between either water or trees and develop a structured plan for an original story. Take inspiration from both observation and imagination to explore setting, character and atmosphere, and discover how the senses in writing can make description even more powerful. Get to grips with Shakespeare’s language and explore central themes of nature and transformation. Choose between either A Midsummer Night’s Dream or The Tempest. Highly physical drama activities using the original text will engage the whole class and bring characters to life. A real-life, all-outdoor maths challenge in which pupils explore shape and space by measuring the height of trees, calculating their age and finding the area of leaves. In teams, pupils calculate the value of a tree by estimating how many planks of wood it can produce using multiplication and division. If you’re looking for a half-day food technology experience, book this session and get the whole class involved in shaking up ingredients that transform into churned butter. Discover growing garden fruits with traditional preservation techniques and work in groups to make dough for bread rolls to take back to school. A fun and fast paced food session!